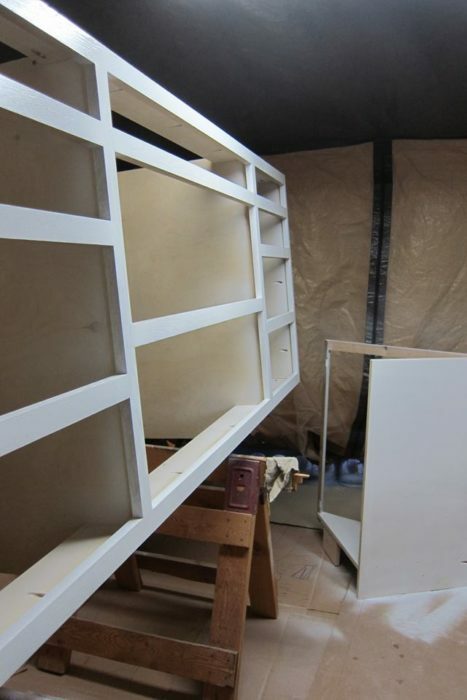 We bought a new camping trailer which arrived early in 2017. 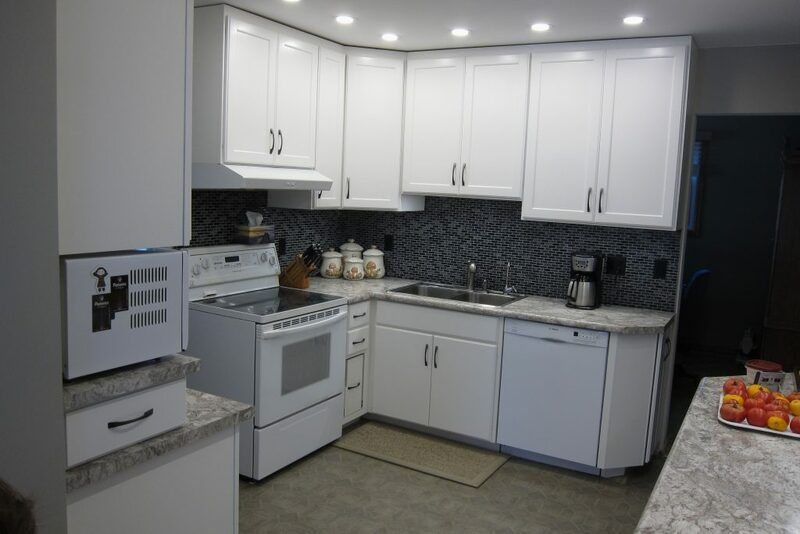 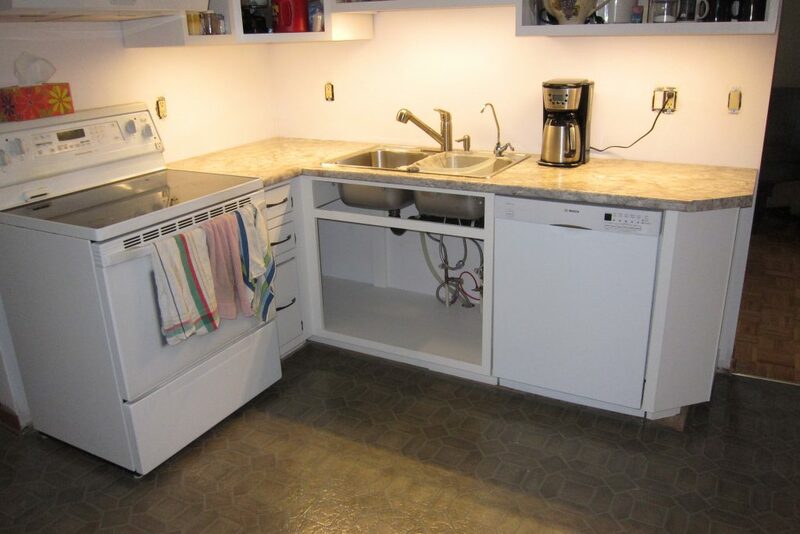 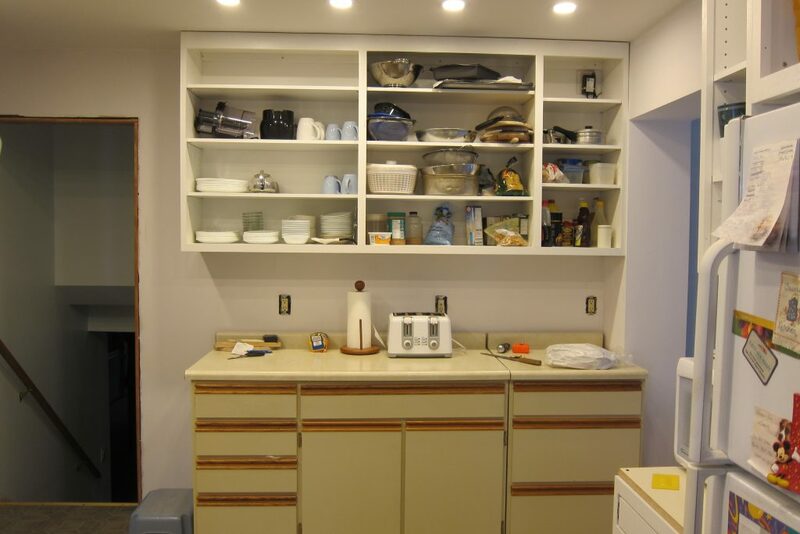 It is an elegant-looking machine, with beautiful cabinets … so much so that we realized it was time to update our 20+ year old kitchen cabinets. 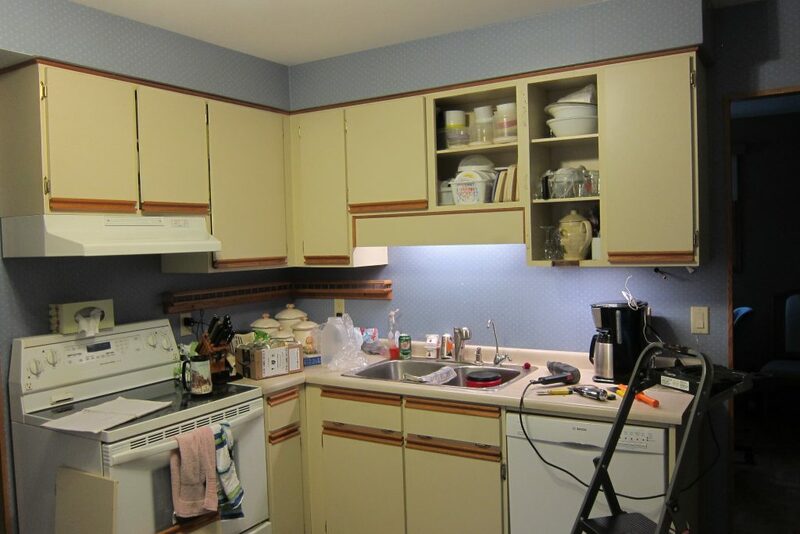 This page chronicles the project from start to finish. 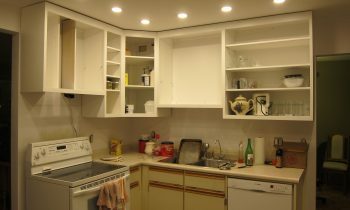 The project began with construction of prototype doors for all cabinets to ensure we really liked what we’d have to live with. 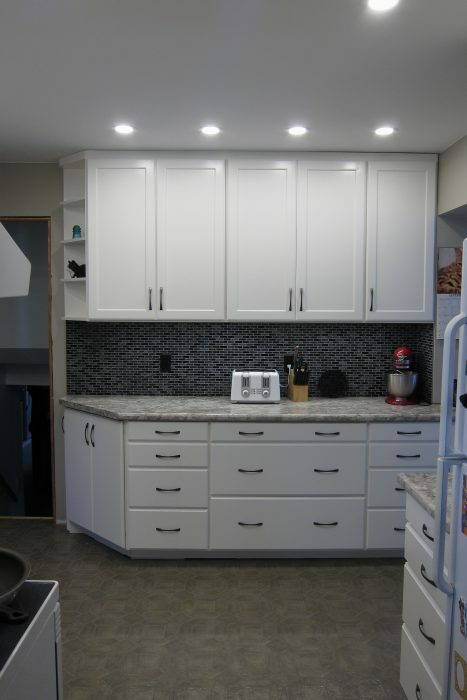 The style chosen was an arts & crafts (craftsman) style just a bit fancier than shaker style but still somewhat simple and lacking sharp edges. 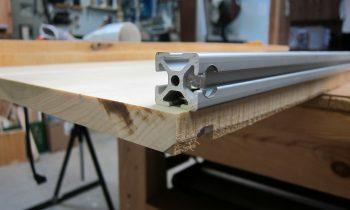 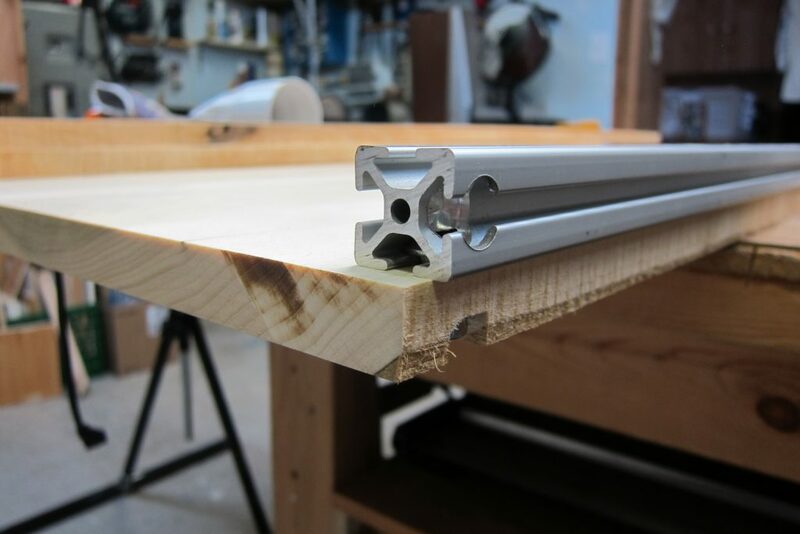 For the prototype doors, all frame pieces were made from poplar and were cut with rail & stile cutters. 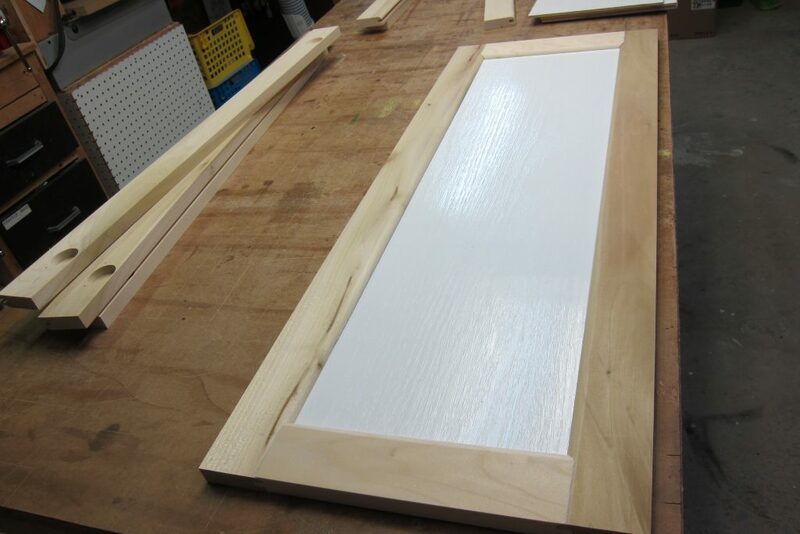 The center panel is made of oak lauan: it was pre-painted white before inserted into the frame pieces (craftsman style door do not usually have raised panels as they would be considered ‘too flashy’). 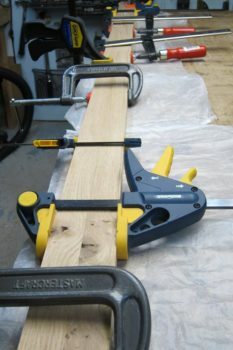 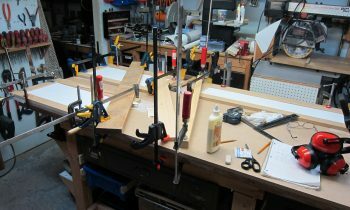 Once assembled (using every clamp I own), the outside of the frame was routered with a “wave” profile. 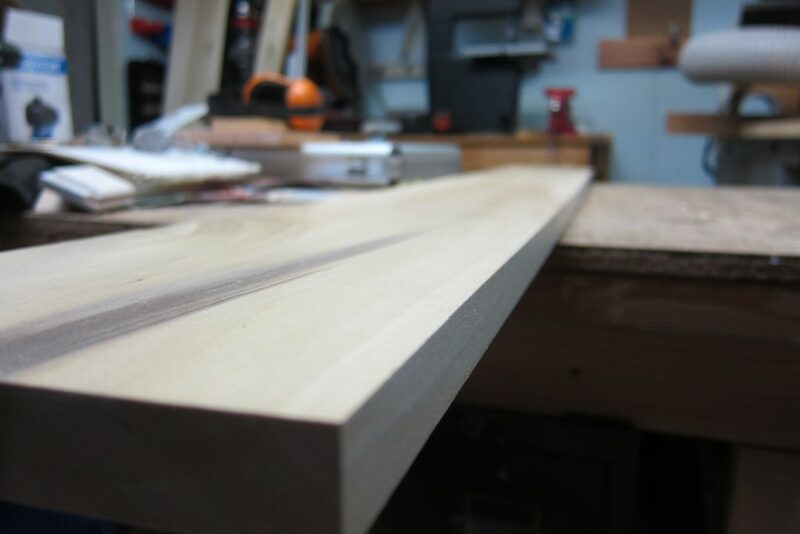 Finally, five coats of paint were applied with each coat sanded between for a very smooth finish (at this stage, we prototyped the finish as well). 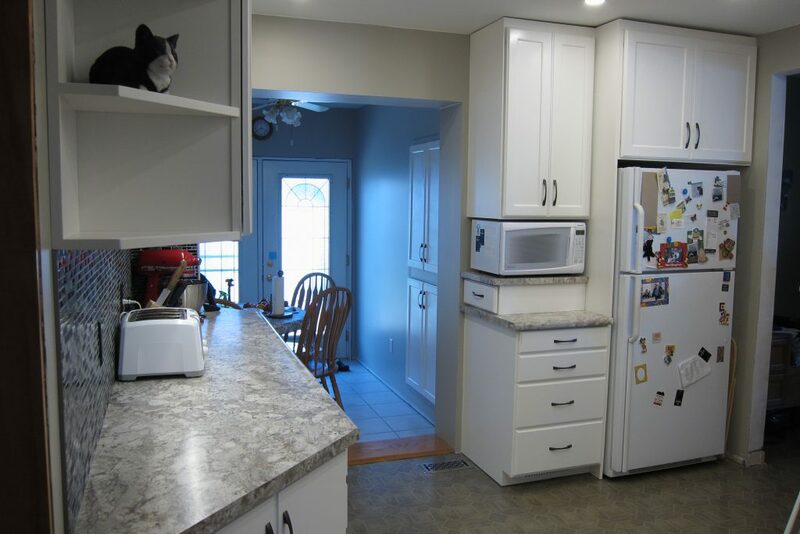 Having selected the style and finish we wanted (we lived with the prototype doors in the breakfast nook for months, even changing the finish from high gloss to semi-gloss), cabinets were built for the kitchen. 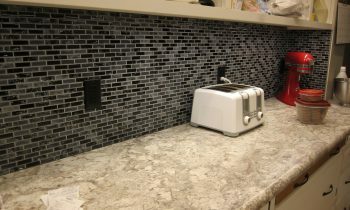 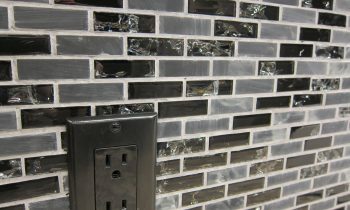 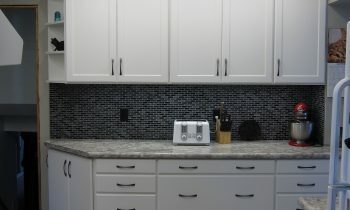 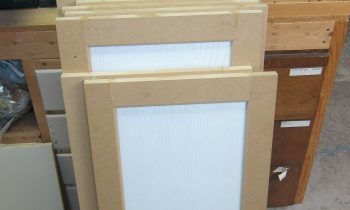 The consistent style on all cabinets features full face frames with 1/2 inch reveal all around. 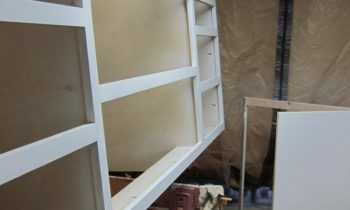 The frames are made of white oak and the cabinets of high-grade Baltic (Russian) birch plywood (the stuff with the really thin ply’s). 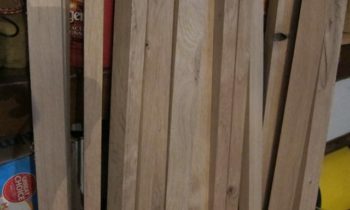 We had flattened and planed a load of oak before the project started and rough-cut the eleven sheets of plywood we bought for the project. 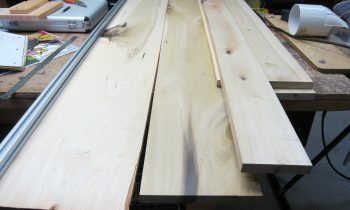 The rough oak used for the face frames is seen here before machining. 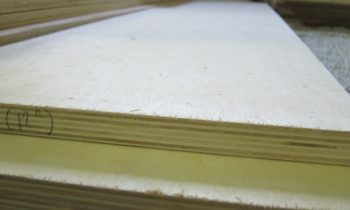 These boards are 2″ thick white (live) oak, covered in mouse poop, and very rough. 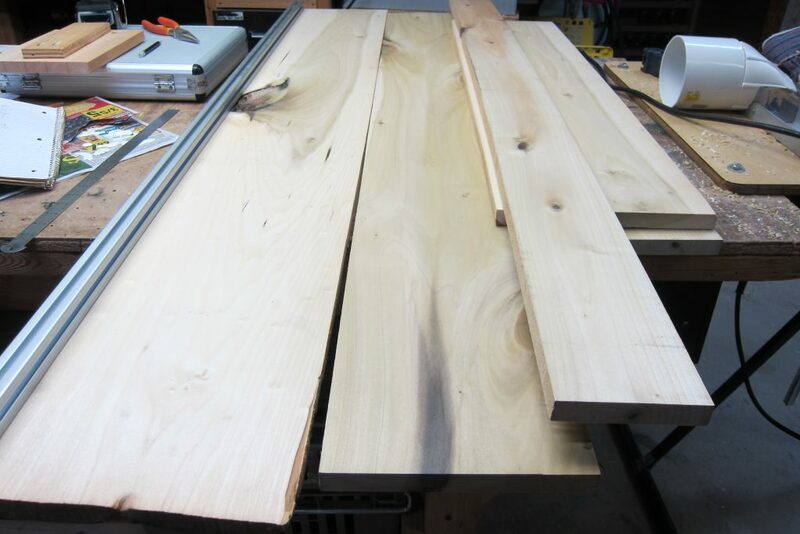 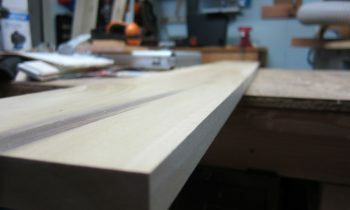 They are also warped in both directions and needed to be flattened with a sled passed through a thickness planer (many, many times given that they are oak and the largest cut one can take is about 1/32″). 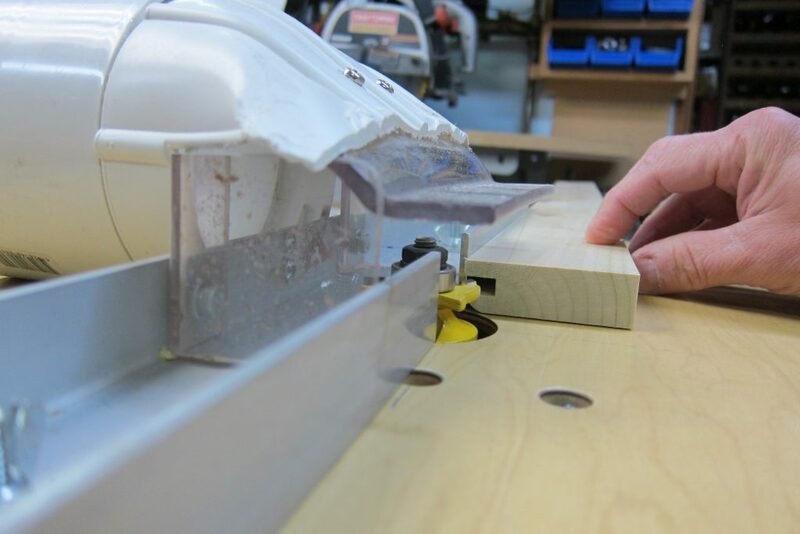 ONE 12 foot board weighs 95 pounds and even a 4 foot board weighs about 30 (almost 40 with the metal sled attached which is required for the first passes through the planer to flatten it!). 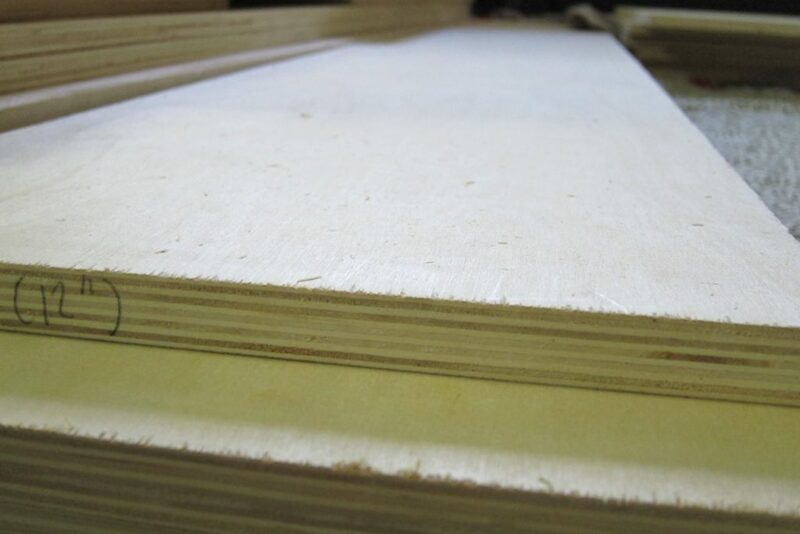 They were cut into lengths four or six feet in length, flattened with a thickness planer, and cut into 1-by-2 pieces (actually one inch by 1.75 inches to be later planed to 3/4 inch thick by 1.5 inches wide). 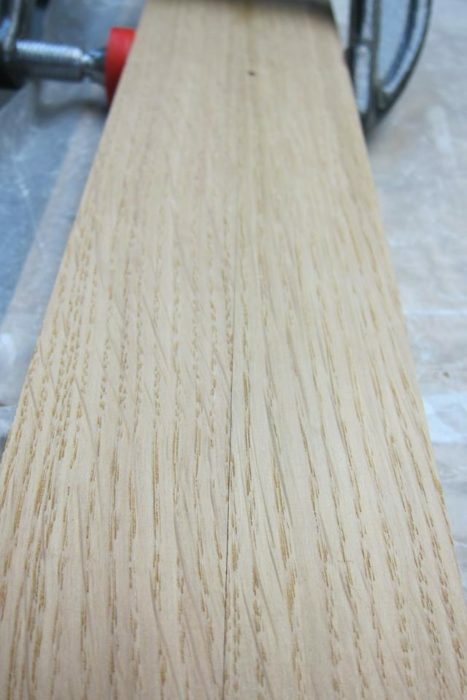 This process took days. 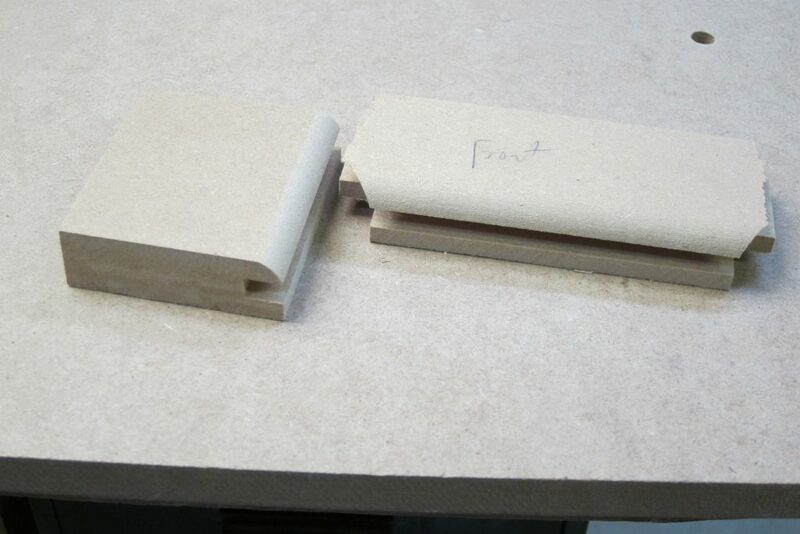 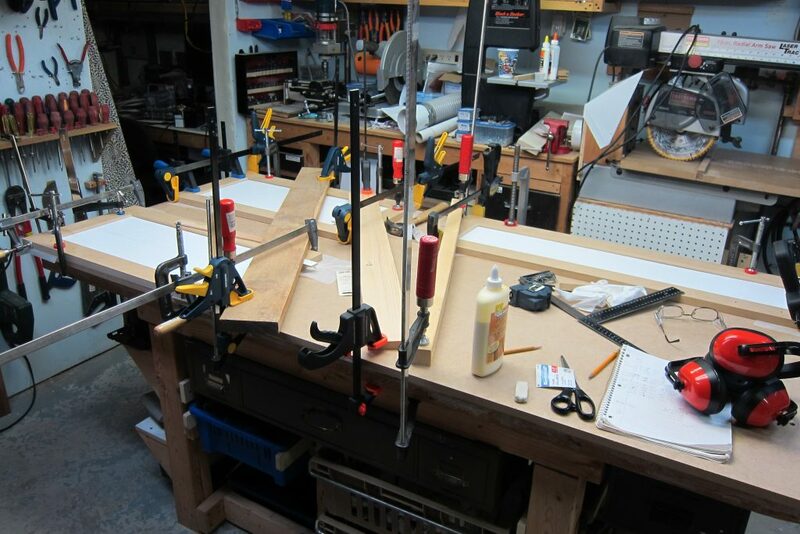 Here we are laminating two 1-by-2’s to make a 1-by-3″ board for the top header of the cabinet. 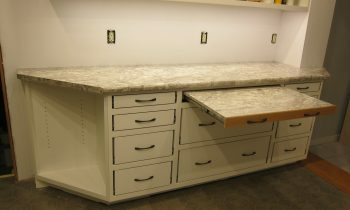 The cabinets will be only 1/2″ down from the ceiling and the wide top header will allow addition of a small crown molding later. 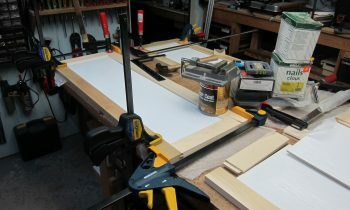 This board still needs to be planed to a finished thickness of 3/4″ (after the laminating glue dries). 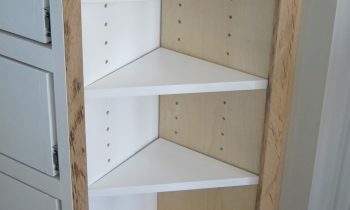 Armed with flattened oak stock, frames were built first and the cabinet built around this. 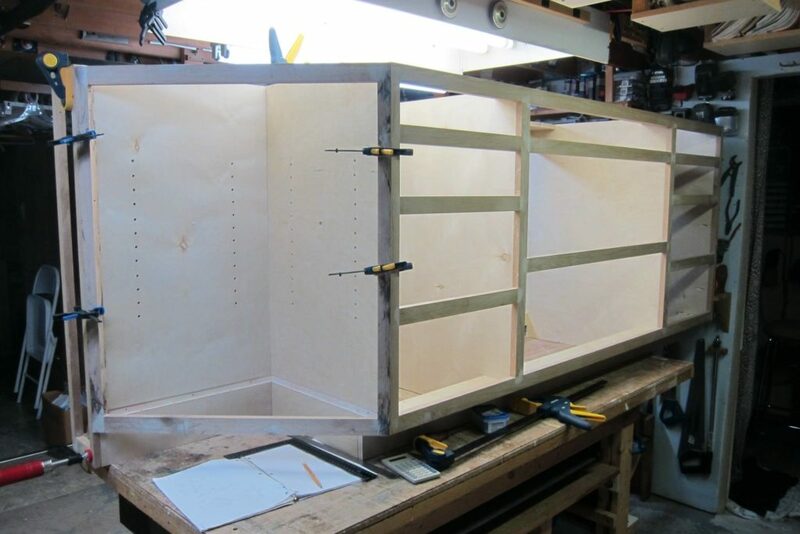 This frame, for the largest wall cabinet at the rear of the kitchen, was almost too large for my workshop and the cabinet needed to be built face-down on the workbench. 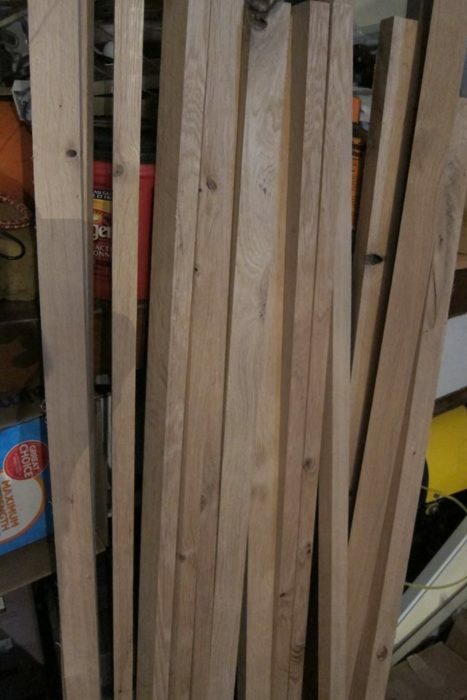 Built of white oak, the frame measures 84″ wide by 40.5″ high and will feature five doors. 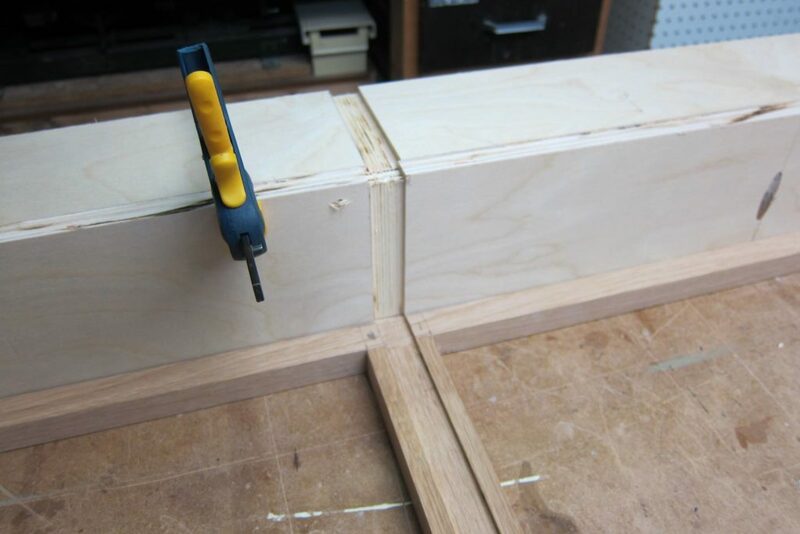 All joints are glued and pocket-screwed from the rear so not a single nail or screw is visible! 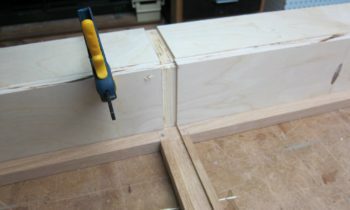 Grooves (3/4″) were routered into the back of the frame pieces for the plywood and in the bottom frame piece a groove was routered for wires for low-voltage LED strips which will be added under the cabinet. 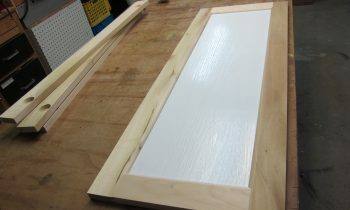 The frame above screwed and glued onto the cabinet. 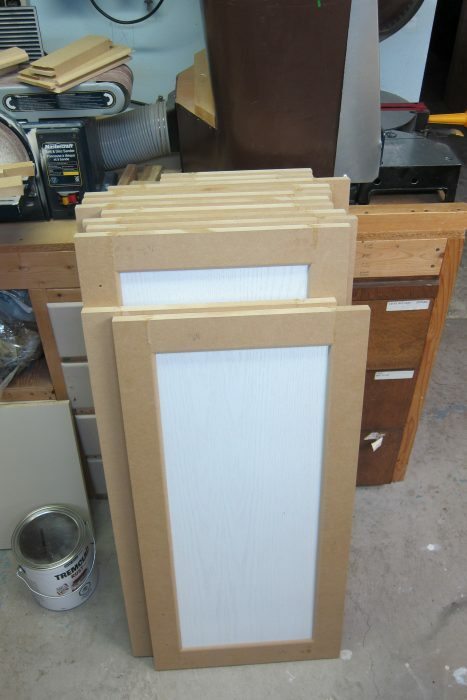 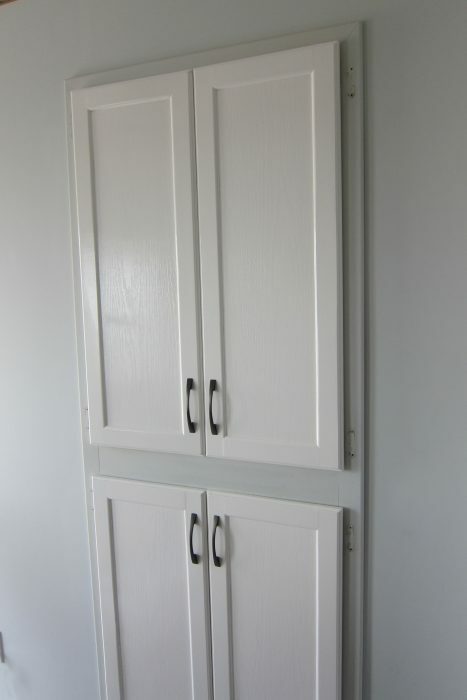 This one-piece five door cabinet will be hung on the rear wall of the kitchen after it is painted. 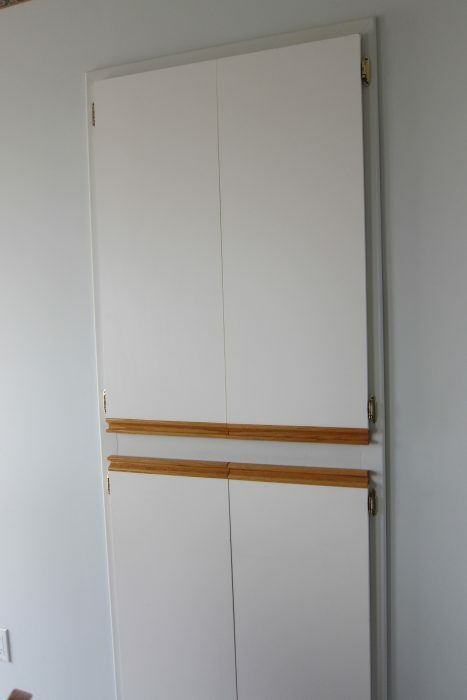 The left two openings hold two doors each (which close against each other) and the right opening a single door. 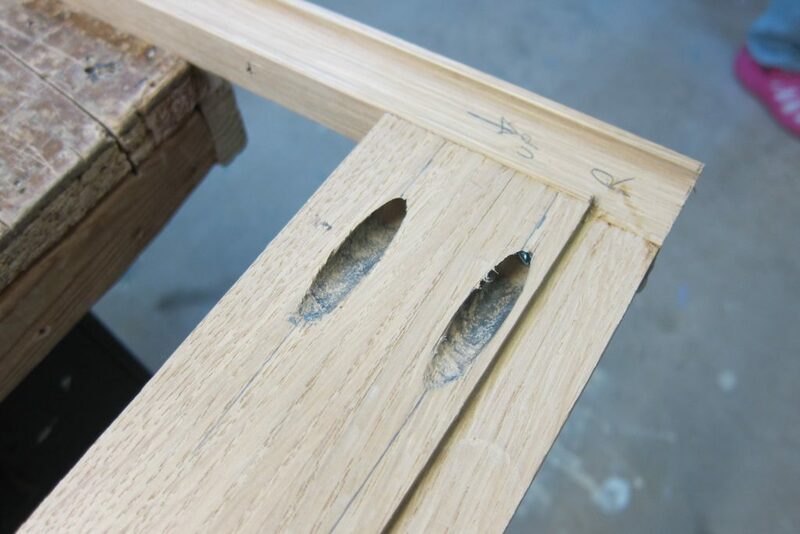 The face frame is of white oak and will carry Euro hinges (not visible from the outside) … wood this strong was found to be necessary to carry the weight of the doors and the torque when the doors are opened. 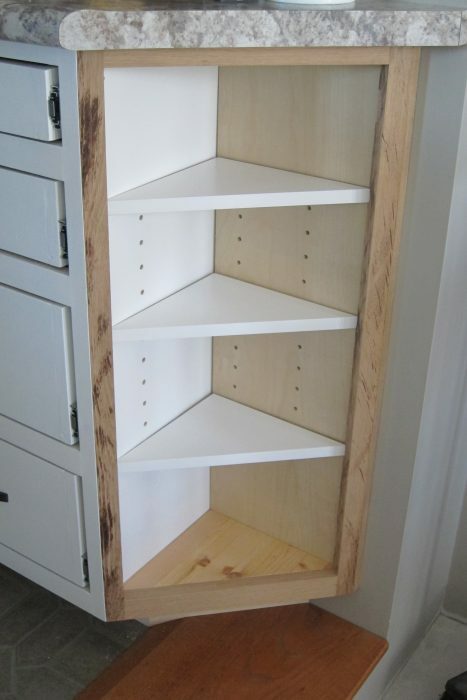 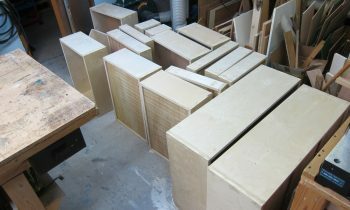 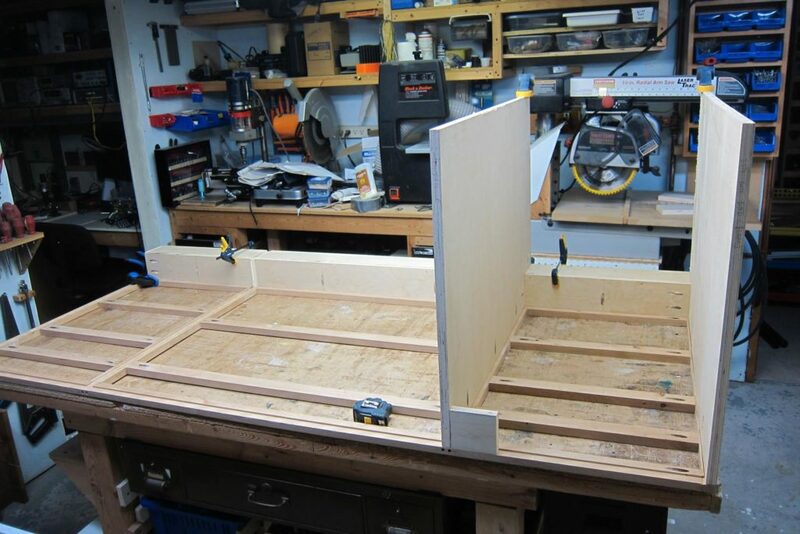 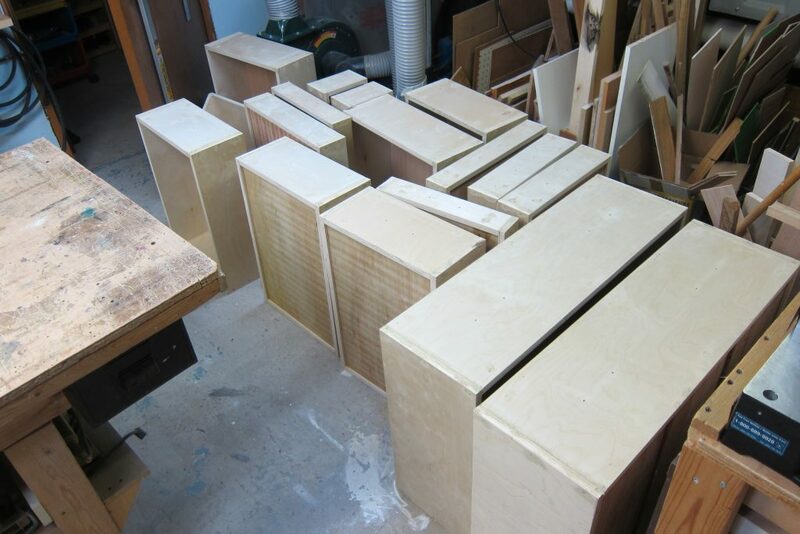 The insides of the cabinet were drilled with blind 1/4″ holes for shelf clips, around 120 plus holes. 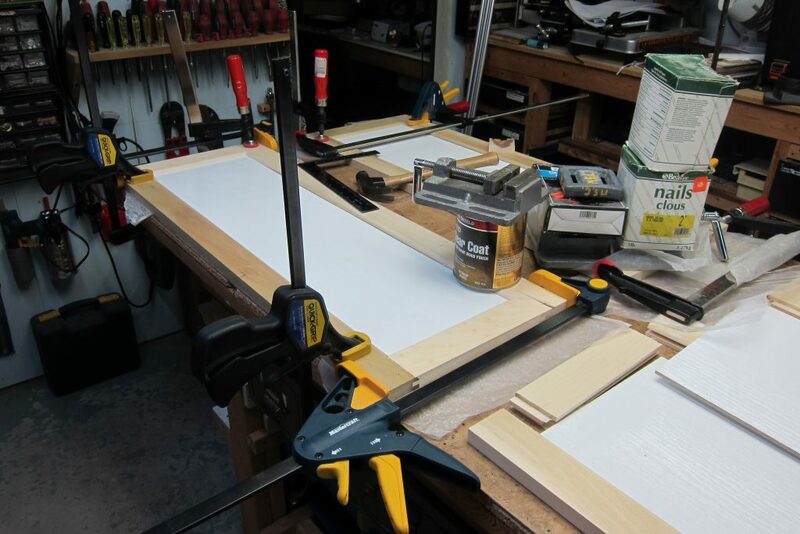 We bought an old dining tent cheap on Kijiji and set it up in the garage for a spray booth since I’m using an HVLP gun to do all the painting – nothing produces a nicer finish than an air gun. 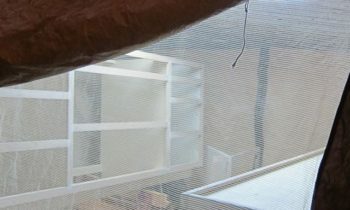 Ten computer fans (sealed with no sparks) and fiberglass air filters were added to exhaust spray from inside the tent during spraying (and prevent it from escaping which would coat the vehicles outside in the driveway). 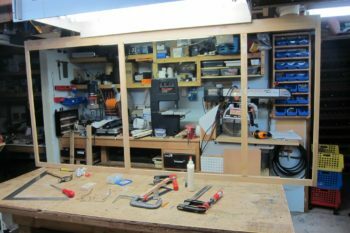 Finally, cardboard was put on the floor so I have a clean little booth to spray everything (‘little’, maybe not, since it is 10′ by 10′ and takes up most of the garage). 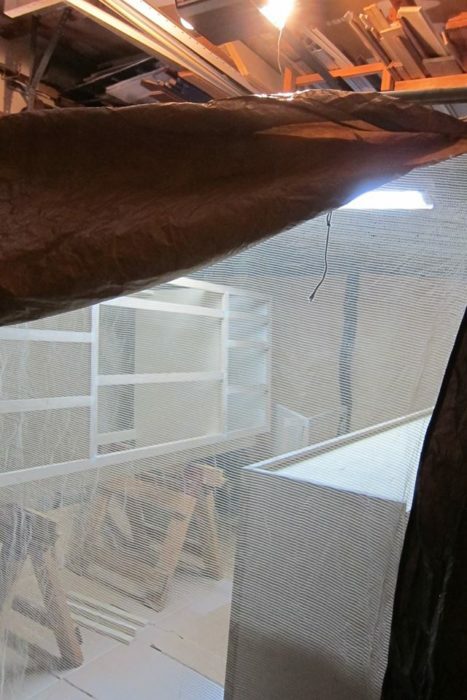 The tent also keeps the damned yellow jackets out! 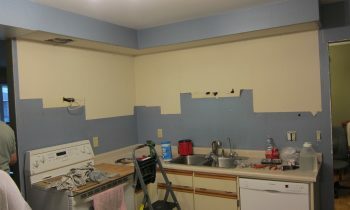 As seen in the photo to the right, I dressed for painting (or a major plague). 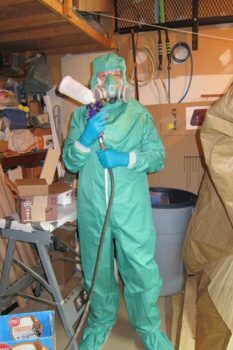 I had a few old cleanroom suits that are perfect for the job since the spray gets everywhere (that green suit is now white) and a proper organic respirator is a must! 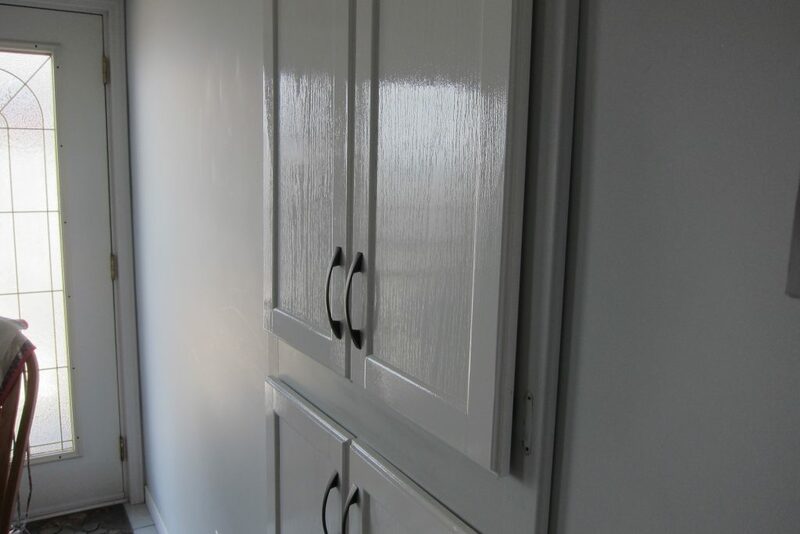 The paint is pretty nasty stuff while spraying. 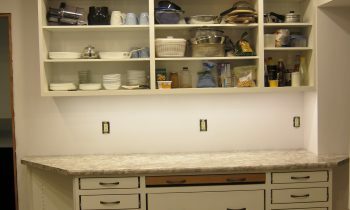 Since the cabinets were placed inside the tent for painting, we mounted two 40W tubes in there as well for better lighting. 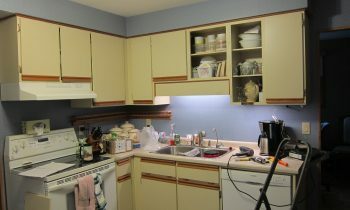 The upper cabinets were installed first. 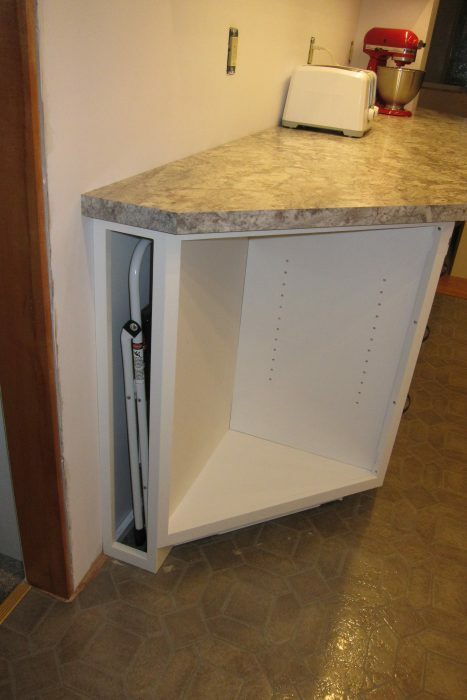 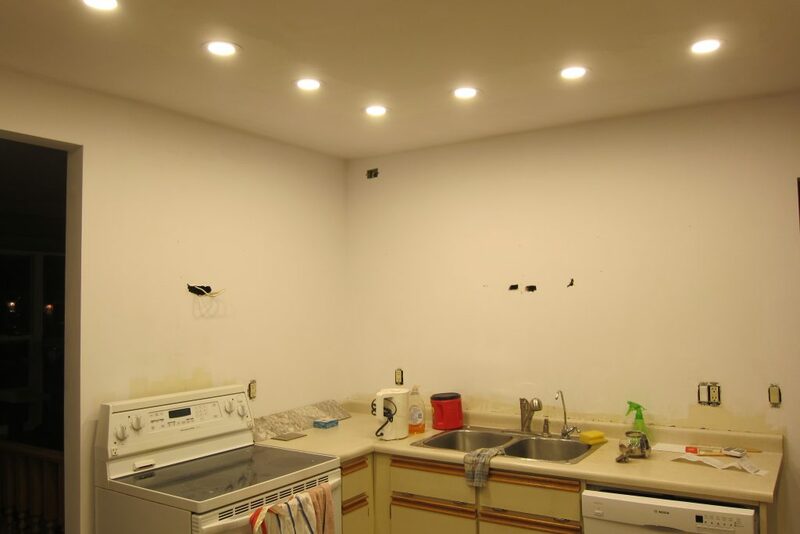 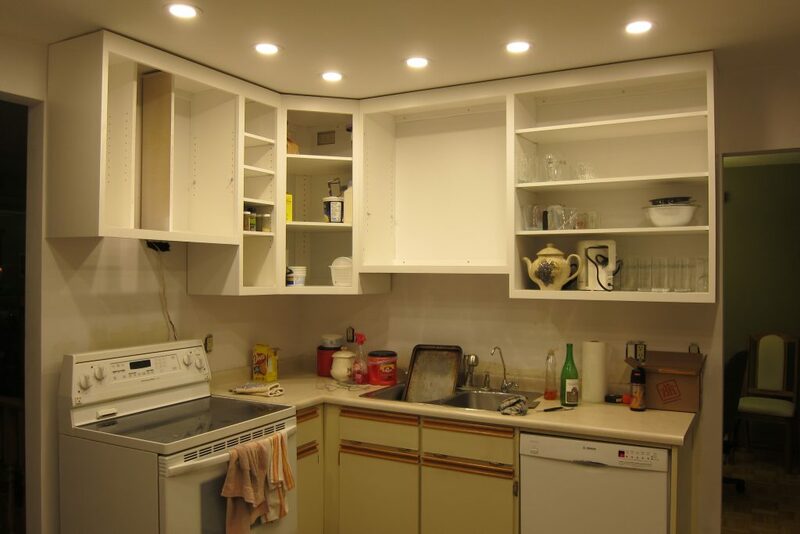 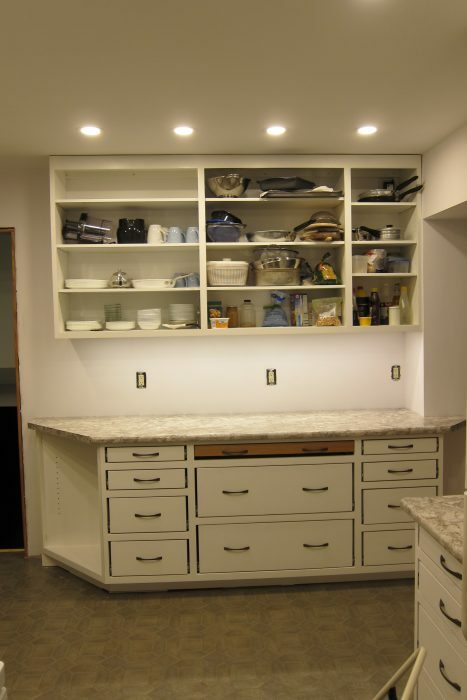 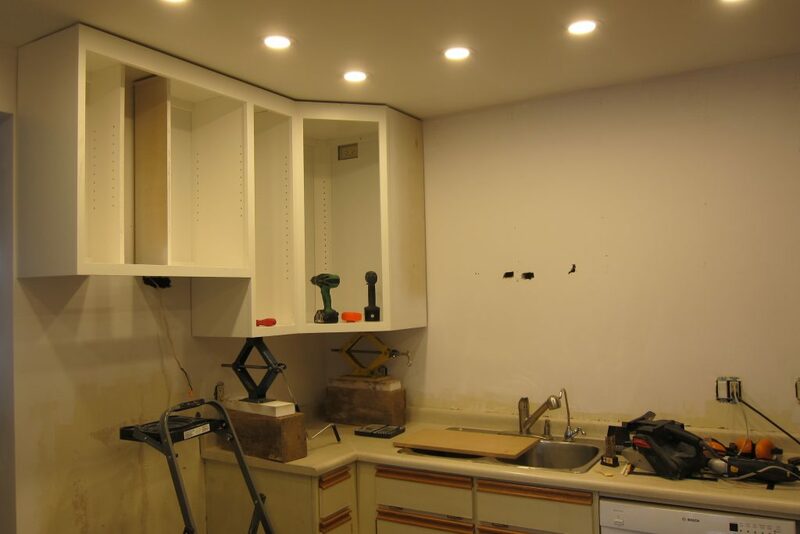 The process began with removal of the old cabinets – easy enough since this involves only removal of screws – but then the problem became removal of the bulkheads above the old cabinets. 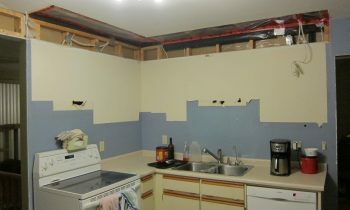 These bulkheads were open to the attic above and were filled with pink insulation. 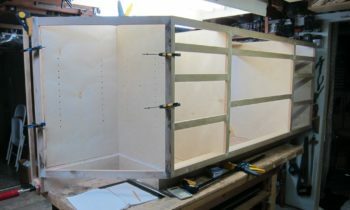 After removing the insulation (which was blown-in and so a real mess) the bulkheads were cut out leaving long holes open to the attic. 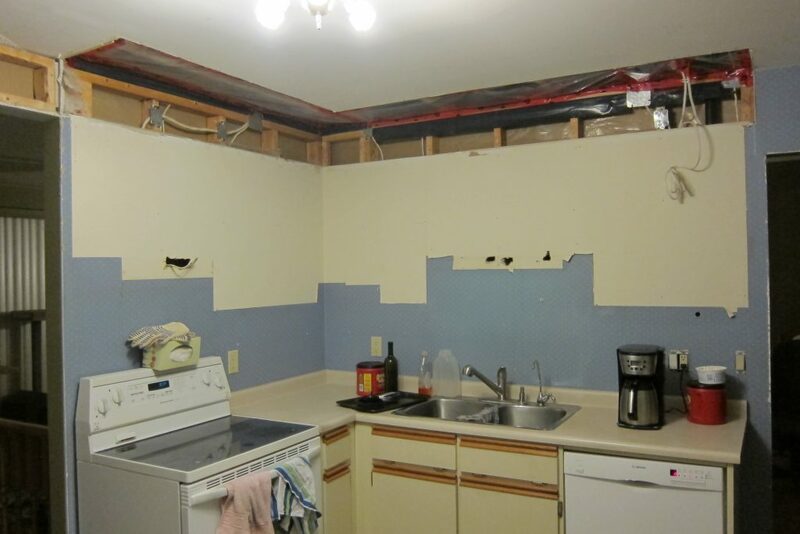 The next problem became relocating wires which were run inside those bulkheads. 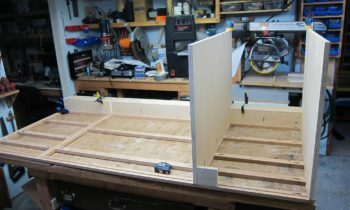 With little slack to spare, wiring was run into slots cut into the wall and top header 2-by-4’s. 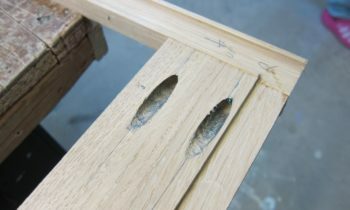 As per code, nailing plates of thick metal were secured over the wire where it was close to the surface of the studs. 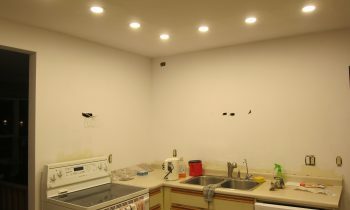 One wire was relocated entirely, and a few spare wires removed. 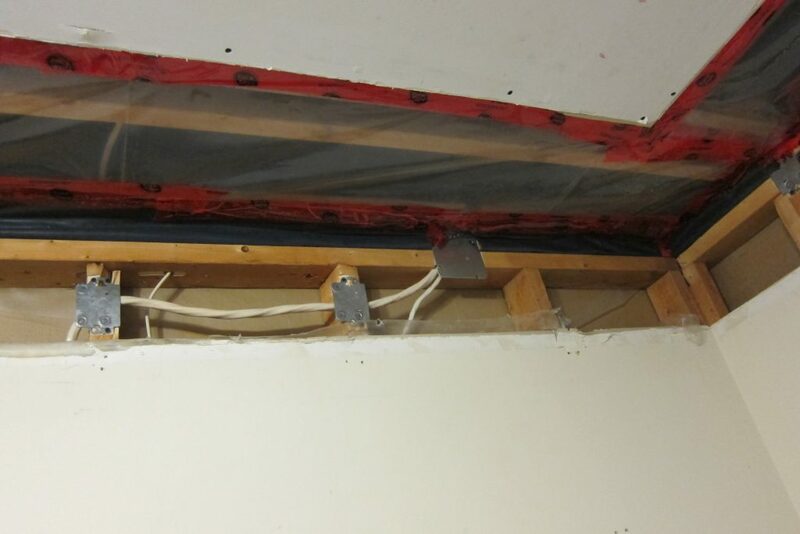 A six mil vapour barrier was taped over the openings and new drywall screwed in place to the ceiling. 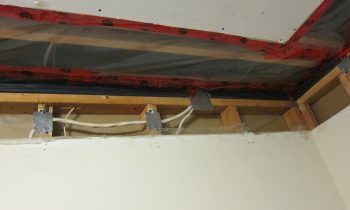 The exposed area in the attic was then re-insulated with fiberglass batts. 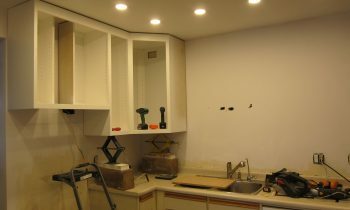 A quick coat of drywall compound on the corner and joints and the cabinets were ready to go up (a “quick” coat since the majority of the joints are behind the cabinets and so will never be seen). 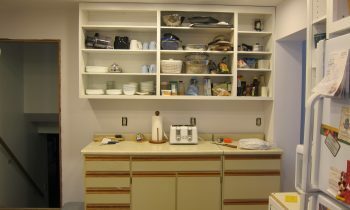 And during all of this, we were still using the kitchen so we kept moving dishes, glasses, and everything else in the cupboards around! 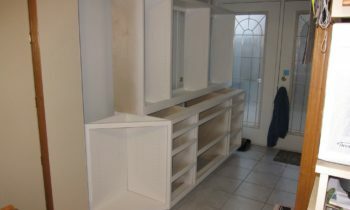 One cabinet at a time was removed then a new one installed. 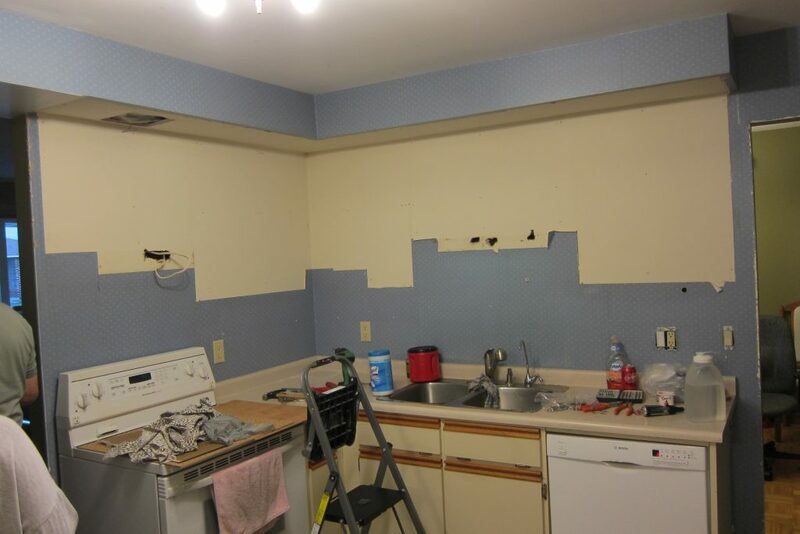 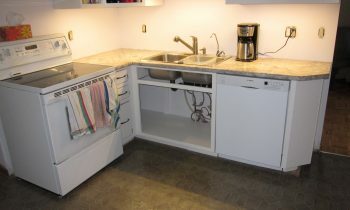 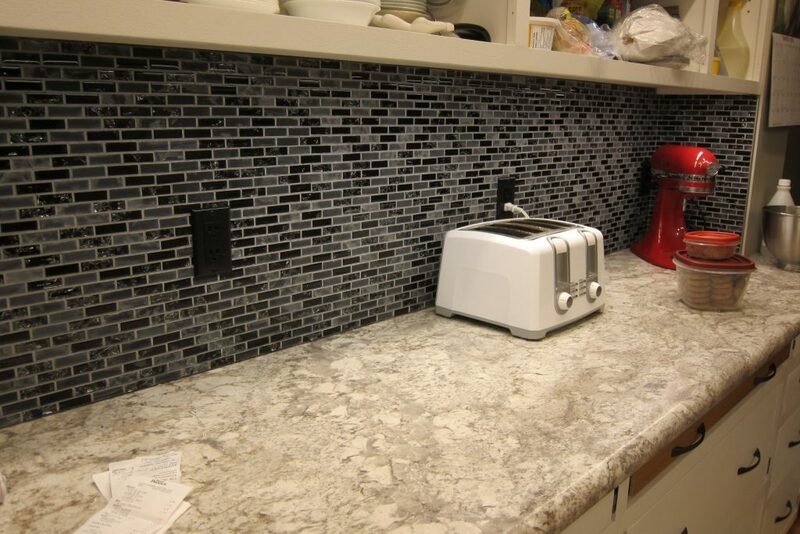 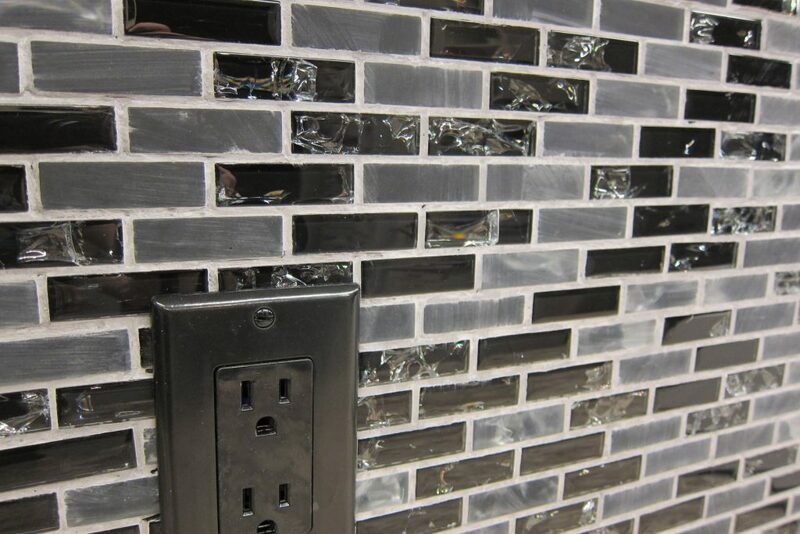 After the base cabinets were installed, a cracked-glass backsplash was eventually installed behind the sink and rear cabinets in the kitchen (over twenty feet of wall). 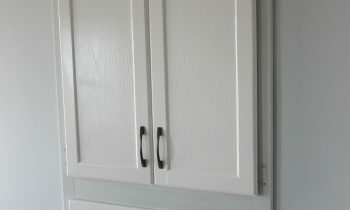 With the cabinets installed, doors were next, unfortunately this had to wait until spring as November was getting too cold to paint (and there was no way we were painting inside the house – this stuff smells AWFUL). 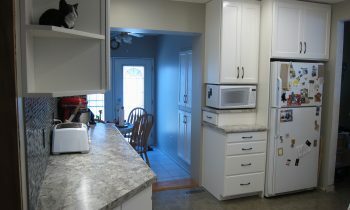 So, we lived all winter with a kitchen with no doors – convenient, but a little sparse for our liking. 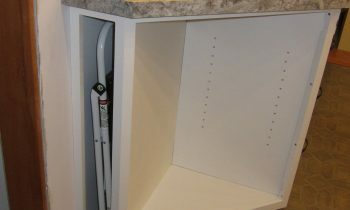 Well, spring of 2018 came soon enough and it was time to close those open shelves. 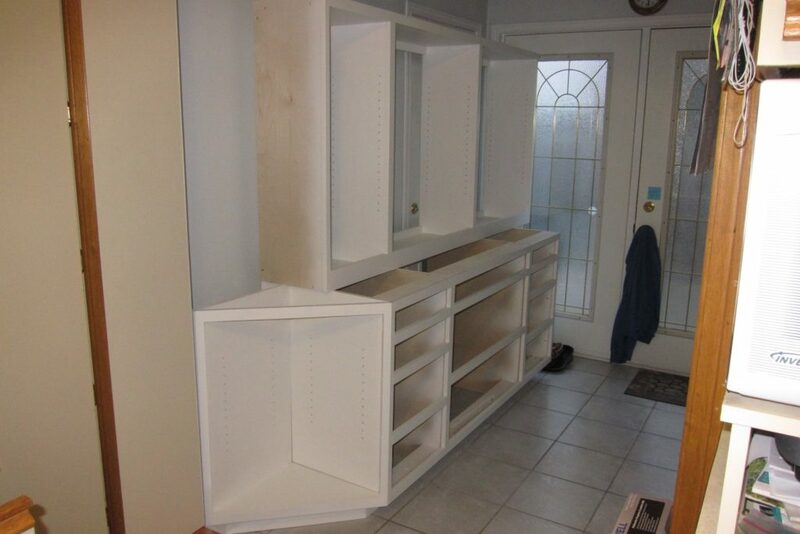 Drawer fronts were made of MDF. 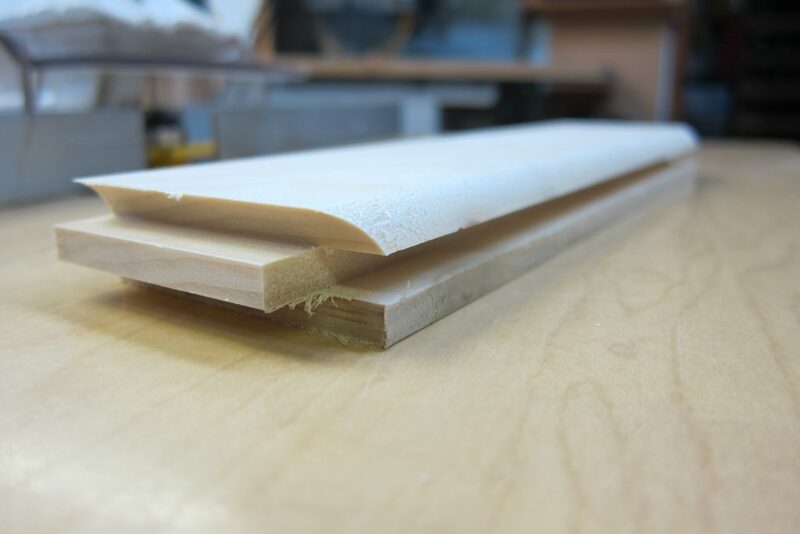 I had originally planned on using laminated poplar however MDF is harder and flatter (and easy to work with) but requires treatment to seal it against water infiltration. 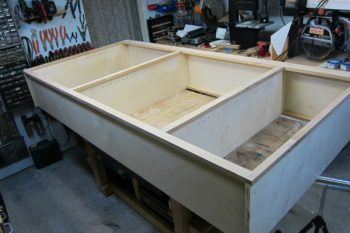 Drawer fronts were first cut as rectangles with a half-inch overlap on all sides to the frame then a ‘wave’ profile routered on all four edges. 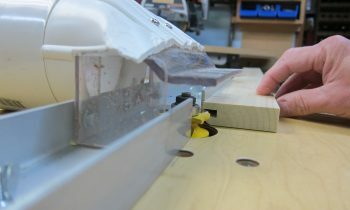 Next watered-down white PVA glue was applied with a roller to bring the fibers out and seal the wood on all sides. 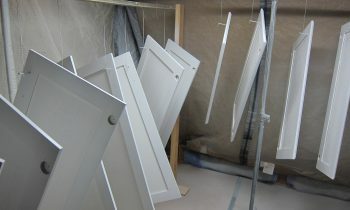 When dry, the now rough doors were sanded, a second coat of glue was then applied, and sanded again. 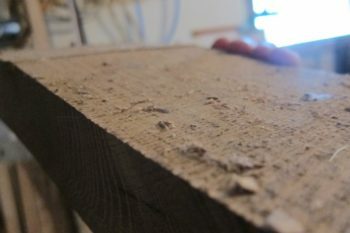 This glue treatment seals the wood (especially the edges) and prevents paint from soaking into the edges. 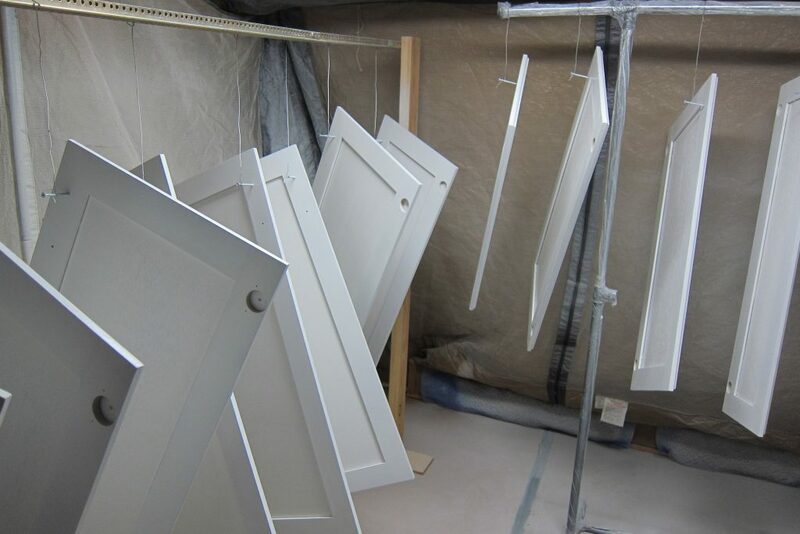 Finally, five coats of paint were applied (three thicker coats with a 2.4mm spray gun, sanded after each coat, and two finishing coats with a finer 1.4mm HVLP gun). 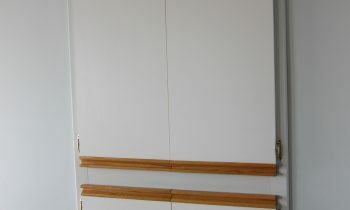 While all lower drawers and doors were ‘slab’, upper doors were of rail & stile construction almost identical to the prototpyes. 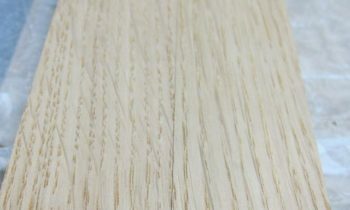 An oak-veneered lauan panel was painted with two coats before being used. 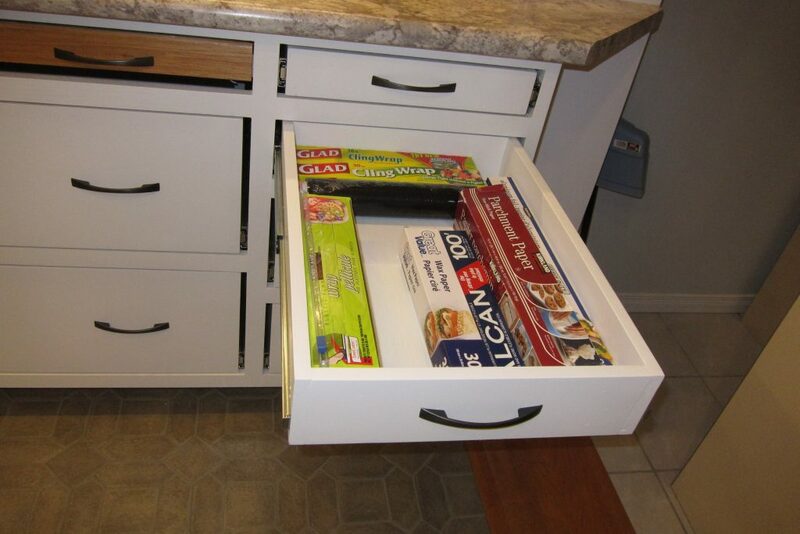 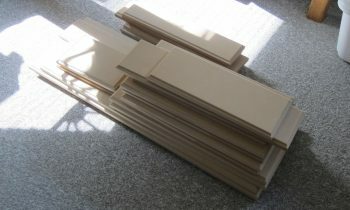 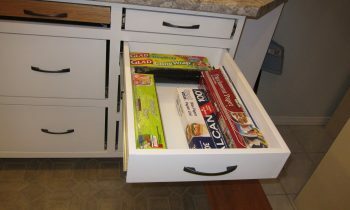 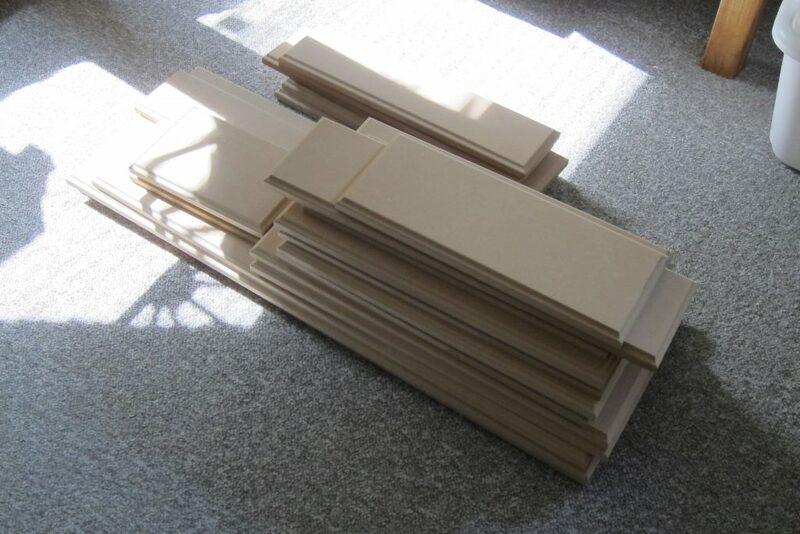 Like the drawers, MDF was used, cut into 2.5 inch strips. 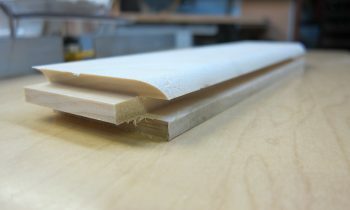 MDF routers well and is very flat. 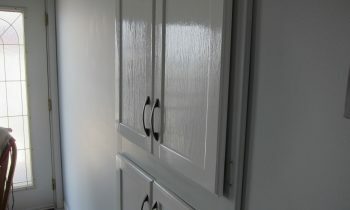 Like the drawers, two coats of sealing glue were applied followed by five coats of paint.